i still don’t know how i should feel about me being someone that comes to mind when my male friend decides he wants to head out for some legit “man food” and needs an eating companion… to put it nicely i would say that i guess people around me recognise my extremely healthy and large appetite, to put it less nicely i would simply say i’m known to be a greedy pig who is ready to eat everything and anything all day every day. 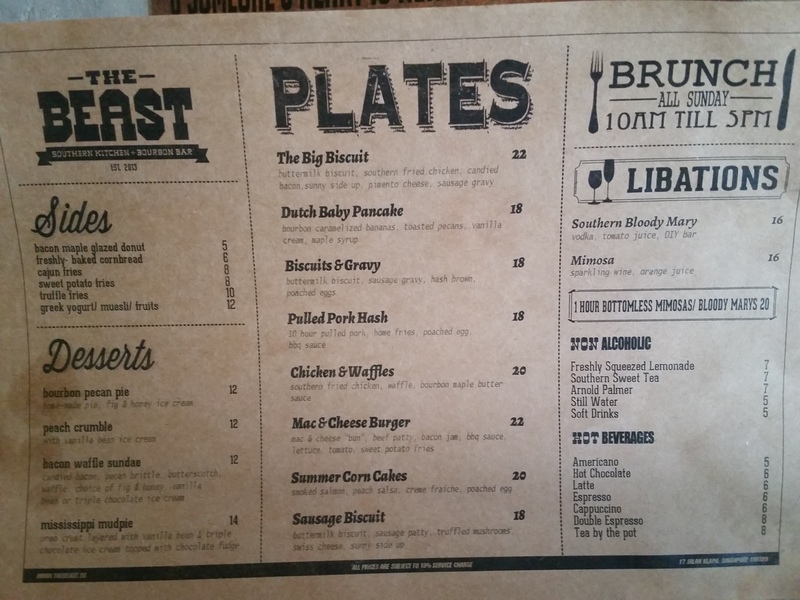 the aforementioned legit man food was to be found at the beast, so off for their sunday brunch we rather excitedly headed. 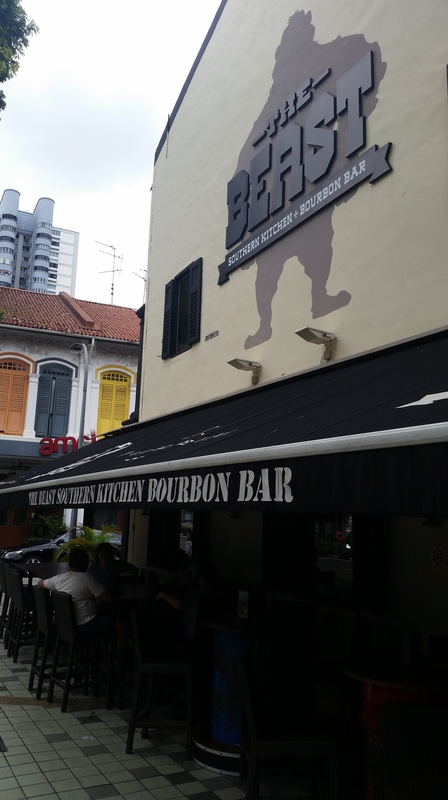 what i feel sets the beast apart from the myriad of other eateries and cafes in the haji lane area is its very strong identity as a southern eating spot evidenced in not just its food – think fried chicken, biscuits with gravy, bacon, maple syrup – and drink – mimosas (they have an all-you-can-drink option at $20/h), cocktails and bourbon, lots of bourbon – , but also its decor – large wooden counter tops, bar stools and refurbished oil drums. with so many tantalising and, more importantly, interesting (you won’t find such a quintessentially southern menu anywhere else in singapore, i believe) options on the menu, we were spoilt for choice but eventually decided on the fried chicken with waffles and pulled pork hash, along with a serving of cornbread. 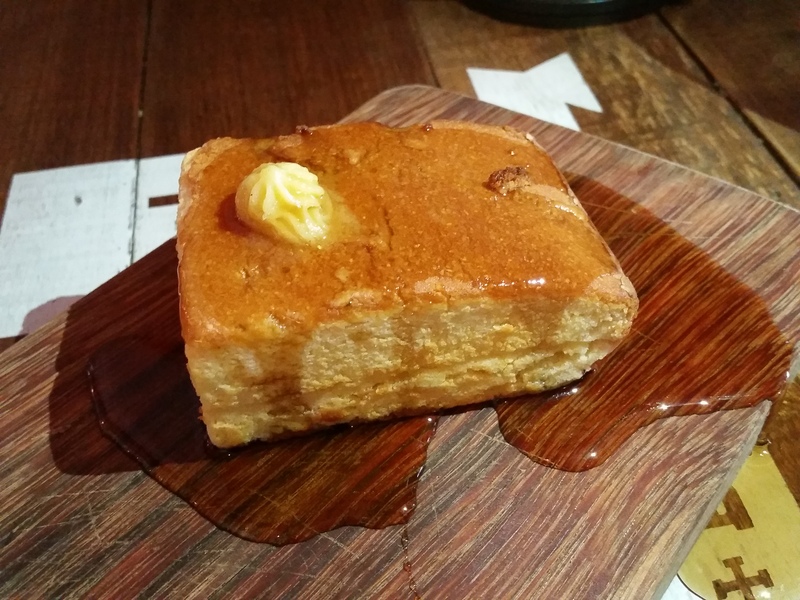 the cornbread was served first, sitting happily on a wooden slab and accompanied by a side dish of maple syrup. we very excitedly poured the syrup all over (the more the merrier) and sat back to admire it glistening in and surrounded by a pool of golden goodness before tucking in. i really love cornbread so this was my dream come true. but even if you’re not as much of a cornbread fan as i am, i’m sure you’ll still thoroughly enjoy it because it was delicious; i would suggest you give this a try if you’re ever at the beast! the cornbread was served wonderfully warm, and had the perfect texture – light, moist and fluffy while still retaining just the right amount of density to be slightly crumbly around its edges. drizzled (or should i say drenched) in maple syrup, it was the perfect mix of sweet and savoury. simple, but very yummy. this was a must-order for us because its probably their most highly publicised brunch offering on social media and was what lured my friend here in the first place. the slab of chicken (you can choose between breast and thigh) was huge; definitely more than enough to have your fried fill with every bite of waffle. it was well-seasoned, the skin oh-so-crispy, and despite it being a really thick slab, the meat within was not overcooked and remained moist. paired with bourbon maple butter sauce, this was quite addictive. 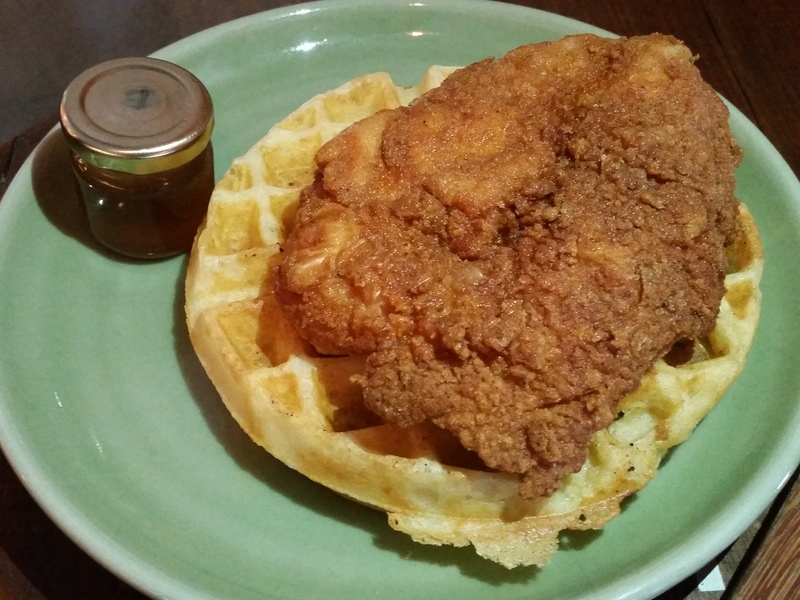 the waffle however, paled in comparison to the chicken that sat proudly atop it. it wasn’t bad, but it was certainly not a standout, not a waffle i would eat if it was not accompanied by the chicken. it was crispy at its edges but i felt it was lacking in density (too light and airy) and taste (batter could definitely have been quite a bit more flavourful). i’d like to give them the benefit of the doubt – perhaps it was intended to be this way so that it wouldn’t be too heavy when taken with the fried chicken? 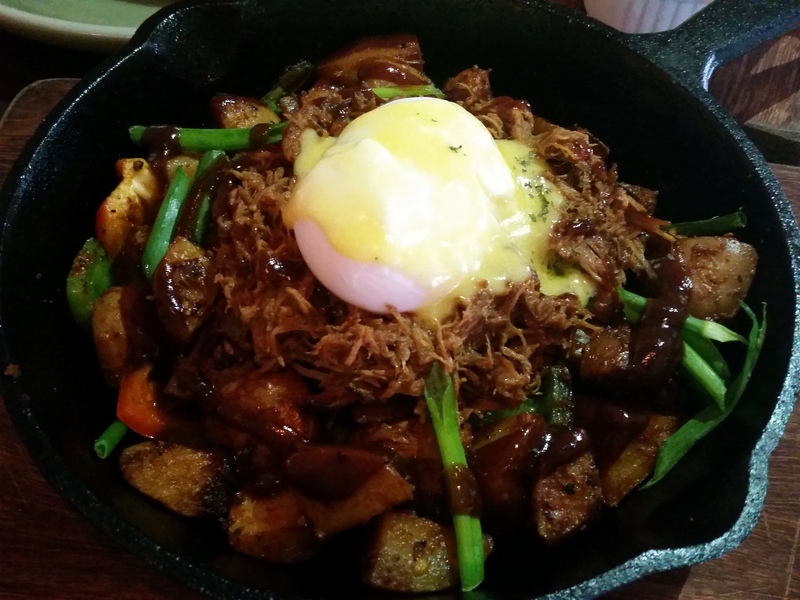 i am a huge fan of pulled pork so this was my choice and we were quite pleased with it! there’s nothing for scale in the picture so i’m not sure if you can see how generous the serving was, quite beastly indeed (sorry, i just had to, the pun was going to come up eventually anyway 😛 ). this was a really hearty dish packed with really strong flavours from the barbeque sauce and egg yolk! the ten hours expended on the pork shone through in how tasty, moist and tender the shredded meat was, and the fried potatoes were addictive and perfect for soaking up the sauce and sweet juice from the pork. each component played a part in the interesting mix of textures offered, and i really liked how the bbq sauce wasn’t overpowering. this was rather heavy though so i’d definitely recommend this to be shared, especially given the portion size. i think a slice of toast on the side would have been a perfect accompaniment to the pork and would have helped lift the dish from being the very heavy-going manly meal that it was. was tempted to end the meal with a bacon maple glazed donut or bourbon pecan pie, but we were wary of the portion sizes and felt like we needed a lighter dessert to wash down all that heavy food (ended up adjourning to artistry for really yummy speculoos cake) so we passed. 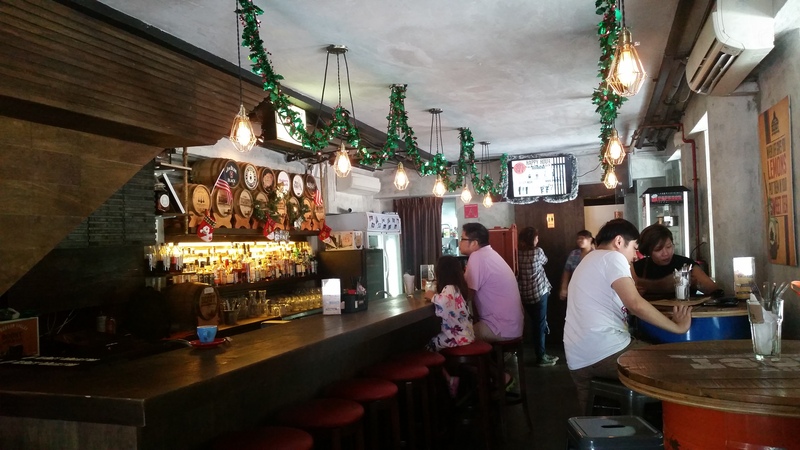 the beast is yet another exciting option for sunday brunch in the haji lane area; you now know where to head to should the queues at maison ikkoku or symmetry be too long to handle!